Kingdoms is a tile-placement game by Reiner Knizia which has some similarities to his game Robot Master. 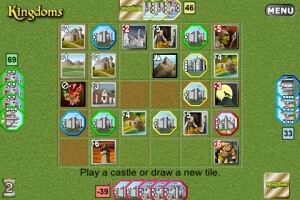 In Kingdoms, players place tiles and their own castles in order to sc0re victory points (VPs). The player with the most VPs after 3 rounds wins. Next to the board, there’s a stack of land tiles too which each have values from -6 up to +6, as well as a few special tiles. Each player starts the game with a set of castle tiles (value 1 to 4) and 1 land tile.